Kaleme, translated by Persian Banoo Protesting violations of rule of law and prevailing injustices, activist and blogger Hossein Ronaghi Maleki has launched a hunger strike again. According to Kalameh, Hossein had previously warned the Judiciary officials that lack of response to his demands will result in his launching a hunger strike. Hossein Ronaghi, protesting lack of attention to his situation, arrest of the earthquake aid workers, violations of the rule of law, and prevailing injustices launched a hunger strike as of Saturday November 3, 2012. According to the family of this incarcerated blogger, Hossein blames the agents in the Intelligence Ministry’s office in Tabriz and Tabriz’s Deputy Prosecutor-General as the main cause for the recent damage to his kidneys and for compromising his health. Hossein had also told his family of the vengeance that the Intelligence Ministry’s agents hold towards him and said he was told by the Intelligence Ministry’s agents that his illness and ultimately his death for them (the interrogators) and for the Islamic Republic is not of any importance. Previously, in separate letters to the Supreme Leader Ayatollah Khamenei and the Chief Justice Ayatollah Larijani, Hossein had informed them of the assaults and beatings that the earthquake relief volunteers workers suffered at the hands of the Intelligence Ministry’s agents, and had spoken of the harassments they and their families suffered from Intelligence agents in Tabriz. The Intelligence officials and Tehran’s Prosecutor General continue to insist on keeping Hossein Ronaghi imprisoned despite being aware of his dire health and illness. This, when according to medical experts and specialists at Hasheminejad hospital, Hossein must undergo proper treatment outside of prison. He must have been accidentally blocked. It has been a long time since he commented on this site. I wish him well and hope that he is doing fine. But, if he has left the site , i certainly hope he reconsiders it and returns. He has been a valuable commentator and contributor. Doroud bar tamaam-e zendania-e siaasi. Support Hossein Ronaghi Maleki Now!Don't wait for "Regime Chang"
continue to witness many social media activists brutally persecuted and unjustly imprisoned in Iran. 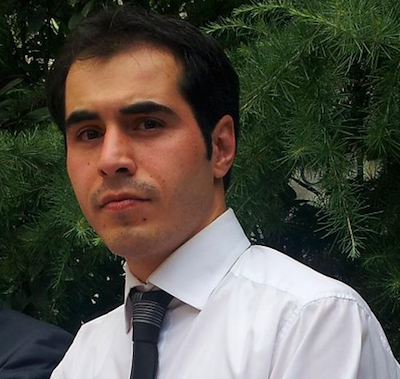 serious concern about the health and well being of Mr. Hossein Ronaghi Maleki who has been unjustly incarcerrated only because of his independent views and social media activities. Regime change is the only way to deal with 34 years of blatant human rights violations on top of crimes against humanity by the Messianic Islamist Rapists, “reformers” and all.